Purcell (right) playing for Boyle Celtic. As one of four clubs left in the FAI Junior Cup — along with holders Sheriff YC, Evergreen FC and Killarney Celtic — Boyle Celtic are within touching distance of a date in next month’s final at the home of Irish football. The reigning Sligo/Leitrim Super League champions face Kilkenny opposition at the Showgrounds on Sunday (3pm), but it won’t be the first time Boyle defender Purcell has lined out at Sligo Rovers’ ground. Purcell enjoyed a couple of seasons playing League of Ireland with the Bit O’Red after impressing as a youngster. “I probably would have given soccer and Gaelic football equal commitment growing up, and then as I got onto the Ireland schoolboy teams the soccer completely took over,” the 31-year-old told The42 this week. “I signed for Sligo Rovers and that was the end of Gaelic for awhile. However, the appointment of Sean Connor as manager in 2004 was to spell the end of his time there. Purcell missed the first four months of the season with a hamstring injury and, after regaining his fitness, he was named in the Ireland squad for the World University Games in Turkey. As he tells it, the centre-half was advised by his new club boss to accept the call-up and gain some match practice. However, upon his return Purcell was informed that he was surplus to requirements. Finding himself at a loose end in terms of sporting commitments, Purcell took up Gaelic football with his local club Boyle and soon caught the attention of Roscommon manager John Maughan. After suffering a dislocated shoulder in his first season at inter-county level, the half-back would go on to play six years with the Rossies — winning the Connacht senior championship in 2010. In 2012, he decided to take time out of the game to get married and do some travelling around Australia and New Zealand. When Purcell got home, he went back playing club while doing a bit with Boyle Celtic, but John Evans — who had taken over the Roscommon senior footballers — never came calling. In fact, it wasn’t until last year that he was reinstated to the panel when Fergal O’Donnell and Kevin McStay took the job. “I would have worked under Fergal before,” he says. “I knew how ambitious he was and about his plans going forward. We were playing Division 1 football, where you’re getting to play the big teams. Roscommon were the surprise package of 2016 in the league — losing out to Kerry in the Division 1 semi-finals — before going on to reach the Connacht final. After the teams couldn’t be separated at Pearse Stadium, the Tribesmen won out a week later in Castlebar. “No disrespect but we were on the easy side of the draw,” suggests Purcell. “You had New York, Leitrim and Sligo and when you’re in Division 1 and going well you would expect to get to the final. We drew the first day in Galway and then we just didn’t turn up the second day. Defeat to Clare in Round 4A ended their involvement in the championship and O’Donnell has since stepped down as joint-manager, while Purcell is one of the players who opted not to return this year. “Kevin has his own ideas and I have mine,” he says. “I wasn’t going back there. I’m just playing club and the journey in the FAI Junior Cup has been a bonus. Although kept busy with the pub, two bookmakers and games arcade he owns with his business partner, he still manages to make time for Boyle Celtic. They may be a junior side, but Purcell and goalkeeper Kyle Suffin gave an example of the commitment involved in last month’s quarter-finals. With both their partners expecting babies, the pair drove down to Tipperary hours before kick-off to line out against Carrick United. It was worth the gamble, as Boyle battled back from 1-0 down to take the lead before a goalkeeping mistake allowed Carrick a late equaliser. But Suffin was to redeem himself with two match-winning saves in the penalty shootout. That set up a last-four meeting with Evergreen, who saw off Kilmallock United in the last round thanks to a winner from ex-Aston Villa and Shamrock Rovers striker Mikey Drennan. He’s played in front of the Croke Park crowd a number of times, but an appearance at Lansdowne Road would be right up there as a career highlight. “It’s hard to put into words,” Purcell smiles. “Even saying it there, it gives you a tingle thinking about it. I would’ve said at the start of the year to the lads that I want to play at the Aviva and they probably laughed. Email “Former inter-county footballer on the verge of Aviva Stadium dream with local club ”. 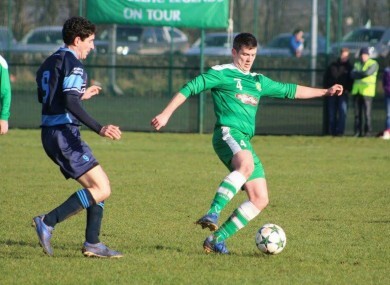 Feedback on “Former inter-county footballer on the verge of Aviva Stadium dream with local club ”.